Master of fish, Nathan Outlaw appears to be following in the very large footsteps of fellow sea lover Rick Stein. In the same way Padstow has been renamed Padstein, Outlaw appears to be colonising the delightful fishing port of Port Issac just over the estuary – could it soon be known as Port Outlaw?! With four restaurant under his belt now (Outlaw’s Fish Kitchen, Outlaw’s at St Enodoc Hotel, The Mariners Rock and Outlaw’s at The Capital Hotel) Outlaw has appeared on Great British Menu and is a popular face on Saturday Kitchen. This is a wonderful omelette recipe chock-full of delicious crab meat, potatoes, and cheddar cheese. Nathan Outlaw‘s crab omelette is a fabulous savoury brunch or light lunch option that goes well with salad leaves or even soup. Stir the onions and potatoes gently for 5 minutes until they begin to soften. While they are cooking, break the eggs into a small bowl and whisk them lightly. Once the onions and potatoes are softened, transfer them into a large bowl and leave to cool slightly. Add the eggs, crab meat, grated cheddar and chives, then season the mixture with salt and pepper to taste. Put the frying pan back on the heat and add the remaining 2 tbsp of rapeseed oil. When the pan is hot, add the mixture to the pan and and turn the heat down to its lowest setting immediately. Periodically draw the edge of the omelette in gently with a spatula, as this will give it a nice, rounded edge. When there is virtually no liquid egg left on the surface of the omelette, turn it over to cook on the other side for 2 minutes more. Turn the heat off and leave the omelette for a further 5 minutes to settle. It should be cooked through but still moist in the centre. Serve hot or cold, cut into wedges, with a mixed leaf salad. 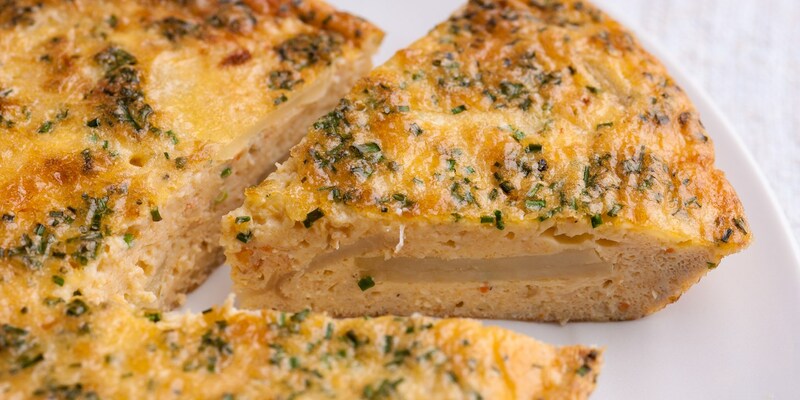 Our thanks to http://www.greatbritishchefs.com/recipes/crab-cheddar-chive-omelette-recipe for this recipe.